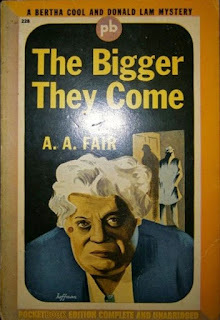 The Bigger They Come was the first of Erle Stanley Gardner’s Cool and Lam mysteries (published under the pseudonym A. A. Fair). It was published in 1939 and was followed by a further twenty-eight Cool and Lam novels. Donald Lam is a young man down on his luck. He has applied for a job. He doesn’t know what the job is or who he will be working for. He doesn’t care. All he knows is that he’s five weeks behind with his rent and he hasn’t eaten since breakfast the previous day and he wants this job. He lands the job and discovers that he is now a private detective, working for Bertha Cool. Bertha is very overweight, very shrewd and very avaricious. Her ethics are flexible. Very flexible indeed. She will take on any job as long as the client has the money to pay for it. That’s not to say that she’s crooked. Getting on the wrong side of the law is bad business. She just doesn’t trouble herself with concerns about the morality of her business. She is also happy to take on any kind of case. Divorce work might be sordid but it pays the bills. Donald Lam is actually a lawyer who ran afoul of the California Bar Association. With the legal profession now effectively barred to him he’s grateful to have any sort of job. And his first case for Bertha Cool promises to be almost ridiculously simple. All he has to do is to serve divorce papers on a guy named Morgan Birks. Birks has been involved in a scandal involving pay-offs to the police but that’s not Donald’s problem. His problem is to find Birks and serve the papers. And finding Birks promises to be easy. Birks’ mistress will lead Donald straight to him. What Donald doesn’t know is that he’s about to get caught in the middle of a web of murder, corruption and deception. The corruption and the deception don’t bother him too much but murder certainly bothers him. The police tend to take a dim view of murder. They’re going to take a particularly dim view of this one when they find out where the gun came from. And that’s going to be quite awkward for Donald Lam. There are actually two plots in this book. The main plot involves Morgan Birks, his wife, his mistress, his wife’s brother, his wife’s lover, his wife’s best friend, a rather unpleasant but very polite gangster and a great deal of dirty money. The second plot, or sub-plot, concerns the plan Donald Lam comes up with to extricate himself from the mess he finds himself in. That sub-plot hinges on an interesting loophole that Donald Lam had discovered in California and Arizona law. It’s a loophole that can allow a man to get away with murder, quite literally. It’s actually a legal loophole that Erle Stanley Gardner had himself discovered, a loophole that was hurriedly closed after this book was published. It’s a remarkably ingenious scheme which allows Gardner to introduce a courtroom scene. It’s a brief courtroom scene but it’s devastatingly effective. 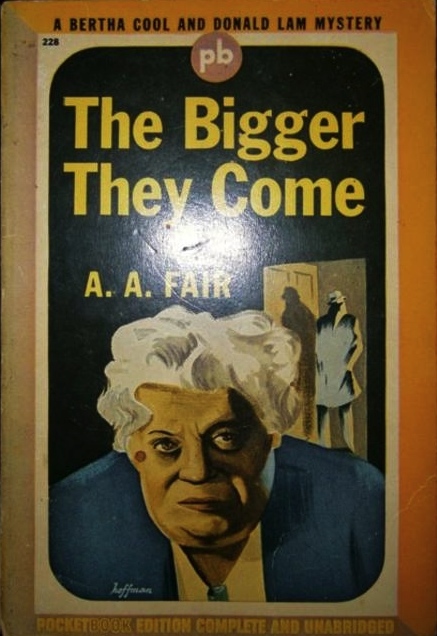 This novel has most of the trademarks that made Gardner’s Perry Mason mysteries so popular - colourful characters, a complex tightly-constructed plot that turns on a fine point of law and Gardner’s characteristically sceptical attitude towards the criminal justice system. Bertha Cool and Donald Lam are an apparently ill-matched pair who turn out to be a very effective private detective team. They’re as fascinating and charismatic in their own ways as Perry Mason. Donald Lam is only a little guy but he’s feisty and if he has to fight he’ll fight smart, and if necessary he’ll fight dirty. Bertha is unscrupulous and absurdly miserly but she’s intelligent and unflappable and indifferent to threats and she’s impossible to dislike. In 1958 a pilot episode was made for a proposed television series based on the Cool and Lam books. It’s actually not at all bad and it’s rather a pity the series came to nothing. I’ve reviewed the Cool and Lam pilot on my TV blog. The Bigger They Come is splendidly entertaining private eye fiction. Highly recommended. 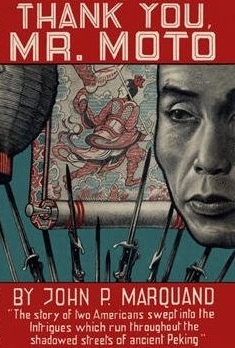 Thank You, Mr Moto was the second of John P. Marquand’s Mr Moto novels, appearing in 1936. The Mr Moto films starring Peter Lorre are better remembered today than the novels but in fact the novels are extremely good. In the movies Mr Moto is a policeman working for Interpol but in the books he works for the Japanese intelligence service. The other major difference is that Moto is not the central character in the novels. The protagonist is generally an American in the Far East. Moto might not be the main character but in a sense he still dominates the books. He is the one pulling the strings, making things happen, or at the very least he is the one who knows what is really going on and what to do about it. The protagonist in this case is Tom Nelson. Nelson had been an up-and-coming trial lawyer in the US who became disillusioned and headed for the Far East. He has ended up in Peking. Nelson is a man on the verge of “going native” as the saying of the time went - he has started to become too comfortable in Peking and even worse he has started to believe that he understands China. In the chaos that was China in the mid-1930s that was a dangerous belief. Nelson is a man who believes that nothing really matters and that there is no point in doing anything other than just drifting aimlessly, letting life take him wherever it will. Nelson has stumbled into a perilous situation that may well become an abyss that will swallow him. It starts out with a woman named Eleanor Joyce and a cashiered British army officer and murder soon follows. This is not a casual murder - it is part of a plot. There were lots of plots in China at that time and most of them were infinitely complex. This is no exception. It involves stolen paintings, an unscrupulous war lord and a plan to take over Peking. It may also involve the Japanese, who were deeply involved in Chinese affairs in the 30s. Nelson does not understand what it is he has stumbled into but he suspects (rightly) that his friend Mr Moto does understand. Mr Moto certainly understands, but is Mr Moto actually involved? Are the Japanese mixed up in it? And if so, which faction of the Japanese military is it that is involved? As Mr Moto points out there is a faction that wants to move aggressively in China and there is another faction (to which Moto himself belongs) that does not wish to provoke a crisis. It is of course possible that both factions are taking a hand in events. Mr Moto is anxious that Tom Nelson should not be embroiled in this affair, and Nelson has no wish to be involved, but Eleanor Joyce has managed to get herself right into the middle of it and Nelson has conceived the quixotic notion of saving her. This is contrary to his own philosophy of non-involvement with life but that philosophy is going to be very severely challenged. As events spiral out of control it seems questionable whether even Mr Moto can find a way out of an increasingly desperate situation. Mr Moto is an intriguing character. He is a loyal servant of the Japanese emperor and his patriotism is unquestioned. He is serving Japan’s interests. Moto however belongs to the faction in Japanese political and military affairs that wants peaceful relations with the United States. He is pro-Japan but he is not anti-US. He is also not anti-China although he clearly believes that Japan can and should extend its influence in that country. Moto can be breathtakingly ruthless but he is also a man of very high moral principles. He also happens to have genuine ties of friendship with Tom Nelson. Moto’s challenge will be to avert a potential political crisis without harming Japan’s interests and at the same time to save Tom Nelson. The problem is that the situation is so difficult that Moto will have his work cut out for him and if he fails in his mission he will of course have no option other than to commit suicide. A challenge indeed. Thank You, Mr Moto is a very entertaining and intelligent spy thriller and a worthy successor to Marquand’s first Moto novel, Your Turn, Mr Moto, but it’s a bit more than that. It’s also a perceptive exploration of the mindset of the European expatriate in the Far East and it even touches on the merits of differing philosophies of life - not just the differences between European and Asian attitudes towards life but also between those who believe it is possible to control one’s destiny and those who believe that such a thing is futile and impossible. This is certainly a book that is slightly more intelligent and ambitious than the average thriller. Highly recommended. 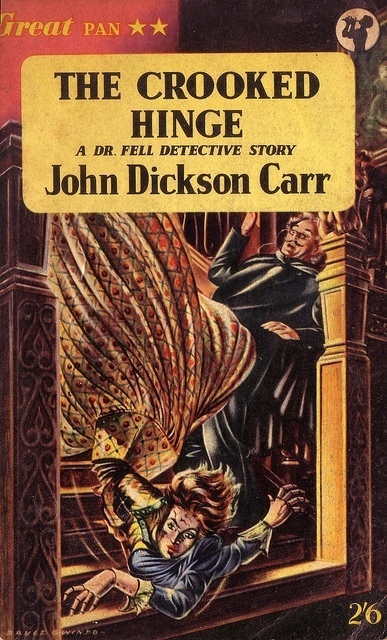 The Crooked Hinge was the ninth of John Dickson Carr’s mysteries to feature his series detective Dr Gideon Fell. It was published in 1938 and seems to be generally regarded as one of his best novels. John Dickson Carr (1906-1977) was an American who lived in England for some years and most of his detective novels are set in Britain. Carr is renowned as the most enthusiastic and most successful exponent of the “locked-room” mystery. What really set him apart from the other great practitioners of the golden age puzzle-plot mystery was his fondness for introducing elements of the macabre. In fact many of his books can fairly be described as detective stories with a gothic atmosphere. The Crooked Hinge is not a locked-room mystery but it is an example of a very closely related sub-genre, the impossible crime mystery. The young John Farnleigh had been a survivor of the Titanic disaster in 1912. He had been on his way to the United States having already established himself at the tender age of fifteen as the black sheep of the family. After twenty years in the US he returned to England on the death of his brother to succeed to the possession of a large and rich estate and a baronetcy. Now a rival claimant for the title has arrived on the scene. In the normal course of events this would result in a long and messy legal battle but in this case it appears that the matter can be resolved almost instantly. Years earlier, before the fateful voyage of the Titanic, Farnleigh’s tutor (a keen amateur criminologist) had taken the young man’s fingerprints as part of a demonstration of the latest criminological techniques. It should now be possible to establish once and for all without any doubts whatsoever which claimant is the real Sir John Farnleigh. Unfortunately murder interrupts the course of events and in the ensuing confusion the fingerprint evidence disappears. The murder itself is most puzzling. The victim was quite alone at the time, a fact verified by reliable witnesses. Suicide would seem to be the obvious explanation but both Dr Gideon Fell and Inspector Elliot of Scotland Yard are convinced it is murder. An impossible murder perhaps, but murder all the same. Surprisingly enough the coroner’s jury is in agreement with them and a verdict of willful murder by persons unknown is brought down at the inquest. Even proving that murder took place is tricky. Finding the identity of the murder will be still more difficult. To make things even more complicated Fell and Elliot are certain that this murder has a connection with an earlier murder but exactly what that connection might be remains a very obscure matter indeed. The novel was partly inspired by a real-life case that had caused a sensation in the 1860s and 1870s, involving a claimant to the Tichborne baronetcy. Around this idea Carr weaves an extraordinarily complex and fascinating plot. He also indulges his enthusiasm for gothic trappings and elements of the fantastic. There is witchcraft, a 17th century automaton, a lawyer deeply involved in the occult, hidden rooms, a cursed garden, gypsy lore, intersecting romantic triangles and of course the events of the fatal night when the Titanic went down will also play a key role. The Thumbograph in which the vital fingerprint resides is a nice little touch. It’s no accident that Carr prefaces his story with a quotation from a book on stage magic. Misdirection is as important to the aspiring murderer, and the writer of detective stories, as it is to the successful illusionist. There’s plenty of skillful misdirection here but Carr was a very firm adherent to the conventions of the fair-play detective story (he was after all a member of the Detection Club) and while the plot is at times outlandish the clues are there. The solution is most certainly outlandish. Whether that’s a weakness or a bonus is a matter of taste. To those who dislike golden age detective stories it will provide more evidence of the artificiality of the form. To those (like myself) who love this type of crime fiction such outlandishness is all part of the fun. Like a good stage magician Carr was an entertainer and as entertainment The Crooked Hinge delivers the goods with breathtaking boldness and panache. Highly recommended. It was the Sherlock Holmes detective stories that made Sir Arthur Conan Doyle world famous and it is these stories that have assured his lasting fame. This would have surprised and vexed him since he himself believed that his greatest literary achievements lay in the field of historical fiction. In fact Conan Doyle’s belief was not unreasonable. His mastery of the historical fiction genre may well have exceeded his mastery of the detective story. 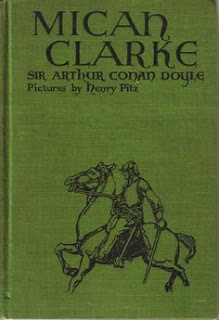 The first of his historical romances, Micah Clarke, was published in 1889. 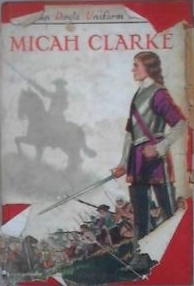 Micah Clarke is set against the backdrop of the ill-fated rebellion of the Duke of Monmouth in 1685. The accession to the English throne of the Catholic James II earlier that year had sparked fears that the new monarch intended to impose the Catholic faith upon the country. The rebellion went badly from the start and ended in abject failure. The story is narrated by its eponymous hero to his grandchildren many years later. Micah Clarke is a brawny but intelligent and devout young man of twenty-one, the son of a junior officer in Cromwell’s famous cavalry in the Civil War. Micah’s own family is not immune from the religious divisions - his mother adheres to the Church of England while his father is a Dissenter. A chance encounter with a roguish soldier of fortune named Decimus Saxon leads Micah Clarke to set off to join Monmouth’s rebel army. The rebels being desperately short of competent officers Micah is soon appointed captain in a regiment of foot, although initially the regiment is little more than a ragtag band of enthusiastic rustics. The regiment is commanded by Decimus Saxon, now holding the rank of colonel. The regiment is on its way to join Monmouth’s main army. Most of the action of the novel is concerned with the various adventures that befall Micah along the way, and those adventures include being kidnapped by smugglers, cast into a dungeon, pursued by the King’s dragoons, pursued by a pack of savage hounds and assorted other scrapes from which Micah barely escapes with his life. The culmination of the story is the bloody and disastrous (from the rebels’ point of view) Battle of Sedgemoor. Although the battle is not quite the end of Micah’s story - he has still to survive, if he can, the ferocious vengeance wreaked by James II on the rebels. Micah is a devout Protestant but he is increasingly disturbed by the ferocity of the religious divisions among Monmouth’s supporters. Micah becomes more and more convinced that these quarrels are futile and destructive and that tolerance would be more Christian. He is also made somewhat uneasy by the fiery preaching of the more extreme Dissenters. Decimus Saxon on the other hand believes that this is a good thing - he believes that fanatics make the best soldiers. The characterisation is rather more subtle than you might expect in a novel of adventure. Decimus Saxon in particular is a fascinating and complex character. He is greedy, grasping, unprincipled, violent and ruthless. He is also a brave and intelligent soldier. He is also capable of surprising loyalty and generosity. He is a rogue but he is not a mere clichéd loveable rogue. Micah Clarke never can decide if his fondness for Saxon outweighs his disapproval of him. He respects him, grudgingly, and eventually learns simply to accept him with his grievous faults and his compensating virtues. Monmouth, as seen through Micah’s eyes, is equally complex. He is feckless, indecisive, unstable and cowardly but also well-meaning and generous. He is basically a reasonably decent man who happens to be hopelessly unsuited for the role he tries to play and catastrophically out of his depth. Micah himself has a certain complexity. He is brave and keen to do what he conceives to be his duty but he has much to learn about life and about human nature, and about himself. Like most historical novelists of his day Conan Doyle has his characters speak in a slightly archaic manner. If taken to excess this can be tiresome but Conan Doyle exercises a welcome restraint in this respect. The archaisms are just enough to give the flavour of bygone days without being distracting. They might not be terribly authentic but I personally feel that they are necessary, in moderation. It’s important in historical novels to make some attempt to convey the idea to the reader that these are not people of our own time. Their values and beliefs are not quite the same as ours. Their values and beliefs are not necessarily superior or inferior to ours but they are different. Conan Doyle was always able to capture this essential quality of historical fiction, of making us aware that we are dealing with a world just a little different from our own, and he was always able to do it subtly and unobtrusively. On the whole his prose is lucid and lively with a good deal of wit. All of his historical novels contain a good deal of humour, and Micah Clarke is no exception. Conan Doyle took his historical fiction very seriously but he also intended it to be entertaining, and he succeeded admirably in that endeavour. Don’t be put off reading this book if you know nothing about Monmouth’s rebellion. The author gives you all the historical background you need. The White Company remains Conan Doyle’s greatest historical novel but Micah Clarke is an impressive example of the genre. It’s intelligent, complex and hugely enjoyable. Highly recommended. Sinister Quest was the third of the Chief Inspector Barnard mysteries of T. C. H. Jacobs. It was published in 1934. 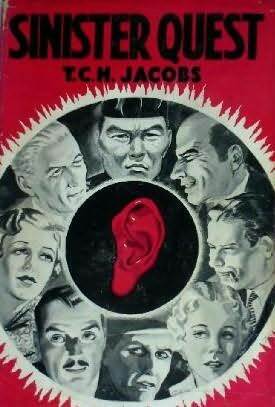 T. C. H. Jacobs was one of the many pseudonyms used by English writer Jacques Pendower (1899-1976) who produced a huge number of books in various genres. Sinister Quest is a murder mystery but with very marked thriller elements as well. I think it’s reasonable to say there was a definite Edgar Wallace influence on this work. The novel is set in Devon, which happens to be where the author was born and raised. Captain Montague Prothero is a guest at the Castle Hotel in Sidmouth in Devon. Among the other guests is a delightful young lady, Barbara Delaine. Miss Delaine having decided on a walk to nearby Peak Hill Prothero had followed her, hoping to strike up a closer acquaintance by running into her accidentally on purpose. He doesn’t find the lady but what he does find is a dead body in a quarry. What he doesn’t know is that he is being watched and that there is more than one watcher. Finding a dead body is not a very pleasant thing but in this case it is rather more shocking than usual - the dead man’s ears have been hacked off! The local police having had a complete hash of the investigation Scotland Yard have been called in. Chief Inspector Barnard is dispatched to Sidmouth, accompanied by Sergeant Trotter. A murder investigation is always a serious matter but this case promises to be particularly important - the murderer may well be the infamous Ear Hound who has slain half a dozen London criminals, in each case lopping off the victim’s ears. It is immediately apparent that the case is going to be a puzzling one. Soon after reporting the discovery of the body Captain Prothero disappears. The behaviour of Miss Delaine’s father is decidedly suspicious. There is the matter of Miss Delaine’s jade necklace, found near the the slain man’s body. There is the unexpected presence in Sidmouth of several notorious London villains. There is a mysterious message on a piece of paper that Captain Prothero found near the murder scene. And what of the inscrutable Chinese gentleman in the otherwise empty Ivy Lodge - empty of everything but a corpse? It gets much more complicated than that - Chief Inspector Barnard will find that the case involves buried treasure, Chinese pirates, Italian gangsters, stolen gems, secret passageways, a madman obsessed with ears and lots more murders. The mysterious powers of the East will also play their part. The overall tone and the various outrageous elements make this novel more of a thriller than a mystery, although there is definitely a mystery to be solved. Whether it qualifies as a fair-play mystery is another matter - Chief Inspector Barnard does hold back a couple of pieces of vital information. This book also plays fast and loose with the rules of detective fiction as laid down by S. S. Van Dine and Ronald Knox, and in fact breaks several rules outright. It reminded me just a little of J. Jefferson Farjeon's At the Green Dragon which is also a bit of a hybrid of the thriller and the detective story. Chief Inspector Barnard is pugnacious and determined but his arrogance, single-mindedness, blunt manner and very low tolerance for fools make him a difficult man to get along with. These qualities also make him quite an interesting detective hero. Sergeant Trotter is one of the few men at Scotland Yard who likes working with him - Trotter remains cheerfully oblivious to Barnard’s abrasiveness. While golden age detective fiction purists might have some quibbles with the book Sinister Quest is undeniably entertaining. Recommended, on the proviso that you don’t mind the mix of mystery and thriller elements. 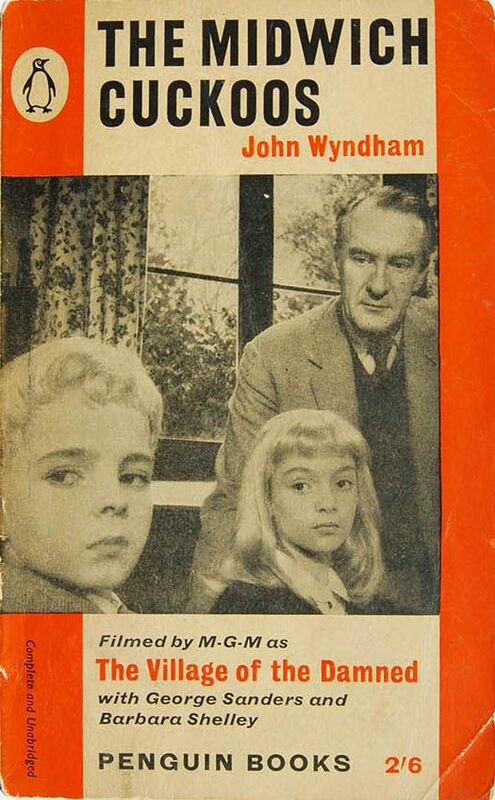 Although John Wyndham had written several novels in the 1930s (such as Stowaway to Mars) it was the publication of The Day of the Triffids in 1951 that established him as a major figure in the world of science fiction. The Day of the Triffids was followed by The Kraken Wakes, The Chrysalids and then in 1957 by what is arguably his masterpiece, The Midwich Cuckoos. These four novels were all, in their rather different ways, disaster novels. While The Day of the Triffids and The Kraken Wakes plunge us into catastrophe very quickly The Midwich Cuckoos was a slight departure in the sense that it was what might be called a slow-burn disaster story. The novel begins in a very low-key with an odd and rather puzzling occurrence in the sleepy English village of Midwich. Everyone in the village is mysteriously put to sleep for a couple of days, after which they wake up with no apparent ill-effects. It’s all very puzzling but it’s soon more or less forgotten. Until it becomes obvious that every single woman of childbearing age in Midwich is pregnant. Even including women who could not possibly have become pregnant. And all had fallen pregnant at the same time - the day that the village had been put to sleep. This is certainly rather disquieting and it leads to a certain amount of speculation. The more thoughtful inhabitants of the village can see that there are some potentially very troubling aspects to this. If women who could not possibly have conceived are pregnant, where exactly did these babies come from? At this stage though there does not seem to be any great cause for alarm. All the babies appear to be perfectly normal. Perhaps there is nothing to worry about after all. Slowly however it becomes clear that there is something to worry about. There is reason to be very worried indeed. These children are too perfect, too similar to each other, they seem to think with one mind and they clearly have an agenda. And they are very very powerful. What initially seemed puzzling becomes disturbing, and finally terrifying. Wyndham tells his story is a deliberately low-key matter-of-fact kind of way. Midwich is a very ordinary village. Nothing bizarre or exciting or frightening has ever happened in Midwich. Surely nothing terrible ever could happen there? Even what it becomes clear that something strange really is going on it all seems unreal - such things just don’t happen in places like Midwich. This low-key approach has not pleased all readers and there are those who have found the book dull. This approach is however a very deliberate choice on Wyndham’s part. It is essential in order to achieve his purpose. The terror has to build very gradually and the story simply will not work unless the people of Midwich steadfastly cling to their belief that the terror cannot be real, until it reaches the point where it can no longer be denied. By which time of course it may well be too late to avert catastrophe. Wyndham has chosen his setting carefully. Midwich is not merely a typical sleepy English village. It is a village that has existed since the time of the Norman Conquest and yet there has never been any real reason why such a village should even exist. No-one has ever been able to discern any reason why Midwich should exist. There is something peculiarly English about this. There is nothing utilitarian or modern or efficient about Midwich. It simply exists because it inhabitants happen to like living there. A theme that runs strongly throughout Wyndham’s work is his suspicion of the modernising forces that were slowly but surely destroying the England in which he had grown up. The very existence of a place like Midwich is an act of defiance against a modern world that that seeks to make everything efficient and useful and mass-produced and uniform. 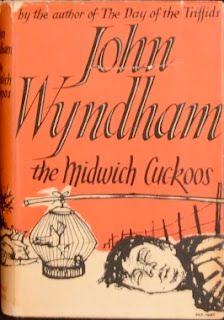 The Midwich Cuckoos can be interpreted as a Cold War anti-communist tale and while I’m sure that was part of Wyndham’s purpose I’m equally sure that his concerns were much broader than this. This is a warning of the dangers of conformity and the loss of individualism and communism is by no means the only source of such threats - consumerism, the mass media and even democracy can be just as dangerous in this sense. The idea of alien invasion by stealth was not new. The film Invasion of the Body Snatchers (based on a story by Jack Finney) had already dealt with this idea. The Midwich Cuckoos is however both more subtle and more terrifying. The aliens in Invasion of the Body Snatchers were clearly and unequivocally hostile. They may have been very difficult to fight but there was never any question that they should be fought. It is more difficult to persuade oneself that a group of children represents a deadly threat - there is an incredibly strong emotional resistance to the idea of seeing children as dangerous and implacable enemies. Cuckoos do not survive merely by laying their eggs in other birds’ nest - they survive by taking advantage of the maternal instincts of the unfortunate host birds. The cuckoos of Midwich operate in the same way - the natural human instinct to nurture and protect children is turned against us. The people of Midwich nourish the very invaders who intend to destroy them. The idea of a hive mind was not entirely new either but Wyndham develops the idea in a rigorous and fascinating manner. This book’s strength is that it not only explores the practical consequences of invasion by a superior species, but also the moral and ethical dilemmas that the invasion poses. It also explores in considerable detail the cultural obstacles that resistance to such an invasion would have to overcome. This is a gripping and frightening alien invasion story that also manages to be quite cerebral and psychologically and morally complex. Evil can be terrifying, but the children in this book are not evil. They merely pursue their own interests logically and with utter determination. Their interests just happen not to coincide with those of our species. This is much more terrifying than mere evil can ever be. In fact The Midwich Cuckoos is a perfect example of the kind of book that really does do all the things that the science fiction genre so often promises but so rarely delivers in quite such an effective manner. This is the thinking person’s alien invasion story. The themes with which Wyndham engages in this novel were certainly very relevant in 1957. They are even more relevant today. The Midwich Cuckoos is one of the towering masterpieces of the science fiction genre. Very highly recommended.